I used this gorgeous wreath from the Verve set Harvest Blessings and the leaves are from the same set. 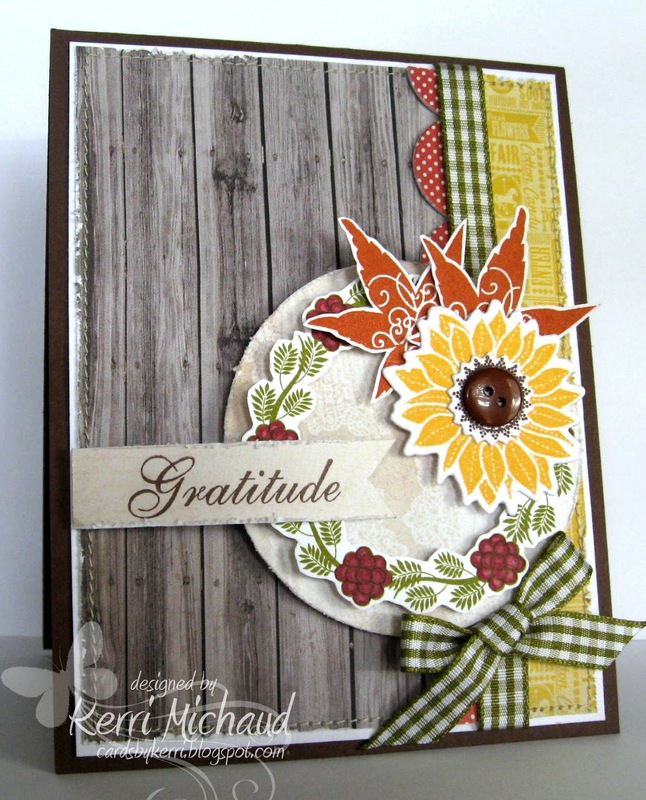 The sunflower is from the PTI Simple Sunflower Stamp Set with coordinating dies. The sentiment comes from the PTI set Fall Elegance, and I used the Deconstructed Sketch #68 for my layout. 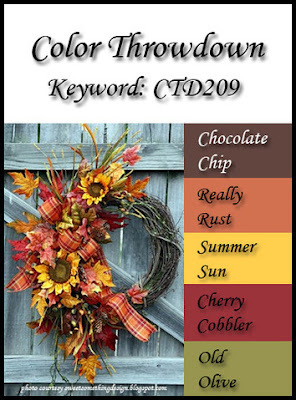 Make sure you check out the Color Throwdown Blog to see the rest of the stunning DT creations and to link your projects! Thank you so much for stopping by and have a wonderful Wednesday! What a beautiful card! Such fabulous colours! Oh-my-word, this is fabulous Kerri!!! You totally nailed this week's colors and inspiration photo, your card is beautiful! The wood back ground, the wreath, the sunflower with leaves...I love it! Gorgeous, Kerri! The wooodgrain patterned paper is the perfect match for these warm fall colors. This is THE most perfect card based on the great inspiration photo!! Love your wreath and sunflower!! Love that you used that grey wood grain pattern in the background. You totally ROCKED that inspiration pic! WTG, Kerri! OMG, what a gorgeous design!!!!! I looove the woodgrained paper in the background and how pretty is that wreath!!! I agree with all the above, Kerri...you did an awesome job with the colors and the inspiration photo!!!! I used your gorgeous card as inspiration for my Diva Dare project today. Credit given, of course :) Thank you for sharing your beautiful work, Kerri!